Centerforce’s DS multi-disc clutch line has been proven to handle more than 1,300 pound-feet of torque while maintaining a street-able pedal feel and delivery. Centerforce has now adapted this technology into its latest high-performance clutch for GM’s LS applications — the DYAD RS Twin multi-disc clutch. The first application of the RS Twin (Centerforce Part No. 08262842) is for 6-bolt crankshaft GM LS engines, including the 6.2 LS3 found under the hood of the fifth-gen Chevrolet Camaro SS and Corvette C6; but it will also be available for LS1, LS2, LS3, LS6, and LS7 applications. The DYAD RS Twin clutch is capable of holding over 800 pound-feet of torque and, like the DS clutch, does not hinder street use or result in an insanely stiff clutch. This is achieved through the use of floating-drive multi-disc technology. 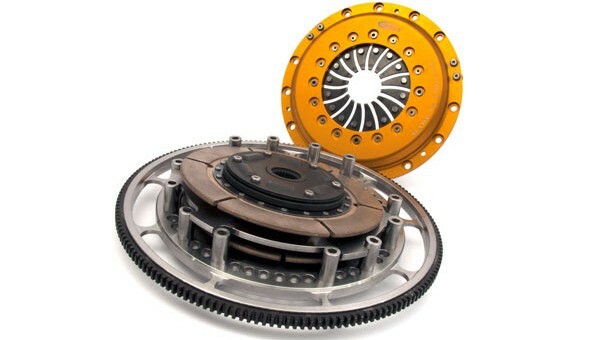 “A sprung-hub clutch drive disc turns the floating clutch disc. A billet floater plate between the clutch discs uses spring-loaded bushings to help absorb geartrain chatter”, explains Centerforce. The primary difference between the DS multi-disc clutch and the RS Twin multi-disc clutch is that the RS Twin clutch features light-weight material in an effort to improve acceleration. The weight savings is the result of a gold-anodized billet aluminum pressure plate in place of the standard stamped-steel unit, as well as a low-inertia flywheel that’s much lighter than the stock flywheel. Centerforce hasn’t announced pricing for the DYAD RS Twin Multi-Disk Clutch yet, but we’d say that you can expect the setup to run at least $1,500-$2,000. Dual disk are great and certainly needed for the high torque/ hp builds but when you get right down to price, they’re way overpriced for a consumable, IMHO. The Spec twin-clutch setup for my Saab 9-3 2.8 would be $1,600 with the new flywheel. By no means disagreeing with the absurdity of the price – but Spec manages to find buyers in that tiny market, and I’d bet there are plenty of LS builds going on where these clutches would be considered – especially if they want the car to remain street-friendly.